The following article originally appeared in Deseret News on July 20th, 2017, and it was updated on July 21st, 2017. On the 170th anniversary of the Saints entering the Salt Lake Valley, a longtime question has now been answered. How long after Mormon pioneers entered the Salt Lake Valley was land surveyed and designated as the official location of Temple Square? A week? A month? According to a recently discovered journal belonging to pioneer surveyor Jesse Carter Little, the location of Temple Square was known the day pioneers entered the valley, July 24, 1847. 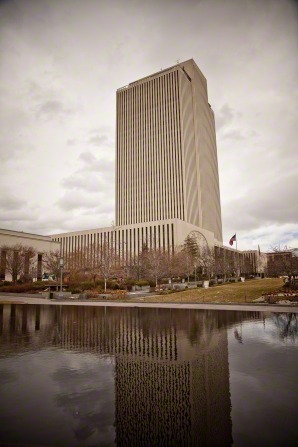 The Church Office Building in Temple Square. Courtesy of the LDS Media Library. In April, Rob Thurston of Provo, Utah, age 60, made an amazing discovery about his great-great-grandfather, Jesse Carter Little. He found his ancestor’s journal containing entries made along the journey west to the Salt Lake Valley. But the journey to acquiring the journal was an adventure in and of itself. In the small confines of the room under the stairs, Thurston remembers seeing an old cream-colored box filled with aged letters and photographs. At the time, the letters were of particular interest because of the stamps that could be cut out and added to his stamp collection. After a lot of hard work, Thurston found out the name of the professor, who, fortunately, was still working at Brigham Young University. He called the professor and mentioned the cream-colored box. Sure enough, the professor still had the box and remembered his mother. Thurston made an appointment to see him. Thurston took the box home and opened it. It held more than 180 items. The box contained a treasure trove of journals, letters and photographs from Thurston’s ancestors. “It gave depth to my ancestors I knew nothing about,” he said. The pinnacle of the discovery was an 1846 journal kept by Jesse Carter Little from the first pioneer company coming across the plains with Brigham Young. It contained tons of detailed information about the company’s trek west. “He recorded how many miles they went, where they reached, location names and coordinates for longitude and latitude with a sextant and compass,” Thurston said. To check the accuracy of Little’s journal, the distance from the address of Fort Bridger to the address of Temple Square was calculated using Google Maps. It yielded 118 miles versus the journal’s 114. 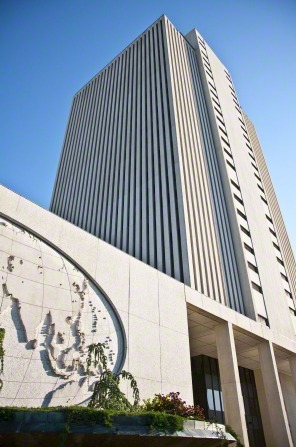 Plugging the longitude and latitude coordinates from Little’s journal into the U.S. government’s NASA website latitude/longitude finder yields the location of Temple Square in Salt Lake City, Utah. 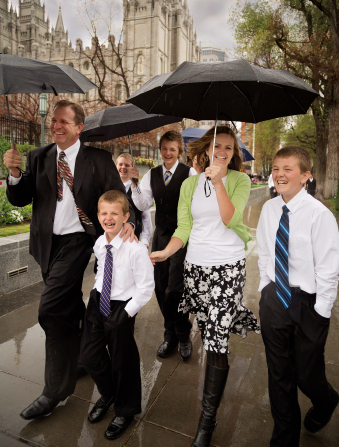 Walking to General Conference in Temple Square. Courtesy of the LDS Media Library. Ryan Morgenegg is a writer for Deseret News.